After our wildly successful winter season back in July (taking in Port Fairy, Melbourne, Geelong and Christchurch), Bad Diaries Salon is back with an early summer cluster of salons, on both sides of the ditch. First up is Bad Diaries Salon #FIVE, as part of Phase Two of LitCrawl 2018. 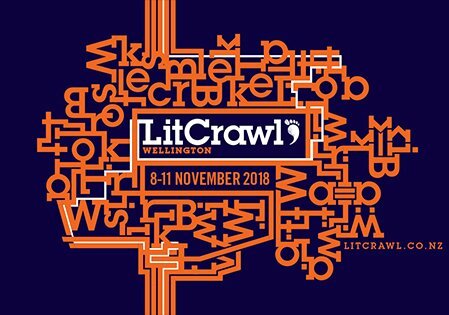 We’re thrilled to partner with local heroes LitCrawl Wellington for this event, and to be bringing another Bad Diaries Salon to Aotearoa, after our brilliant (if I do say so myself) salon at WORD Christchurch back in August. If you like your literary events candid, original and unedited, don’t miss this reveal of writing not meant to be seen or heard. 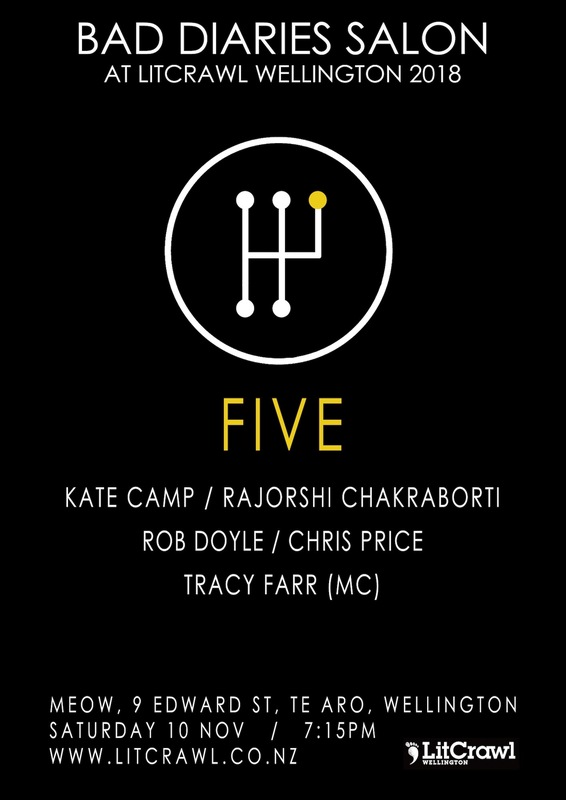 Kate Camp, Rajorshi Chakraborti, Chris Price and Rob Doyle will read from their diaries or abandoned early works. The theme is FIVE, celebrating LitCrawl Wellington’s Fifth birthday. Bad Diaries Salon co-curator Tracy Farr will MC the salon. Tickets: Entry to Crawl sessions is by donation ($5 is recommended). More details on the LitCrawl website, or see our Facebook event listing. Bad Diaries Salon was established mid-2017 with a call out from Jenny Ackland on Twitter – were there any writers who still had their old, bad teenage diaries, and would they be prepared to read them live? The response was overwhelming. Result: Bad Diaries Salon was established, with four salons held in 2017, and a Winter 2018 series. Bad Diaries Salons features writers reading, to a theme, from their diaries and other unpublished juvenilia. Each salon is a unique combination of theme and readers, a performance that is raw, unedited, original and candid: the written word, rediscovered and shared. There are more salons in the works, co-curated by Jenny Ackland and me. Follow Bad Diaries Salon on Twitter (@BadDiariesSalon) or Facebook, or check my Bad Diaries Salon posts.